What Does It Mean to Multiply by a Fraction? When you multiply a number by a fraction, you are finding part of that number. For example, if you multiply 6 by 1/2, you are finding 1/2 of 6. It gets a little trickier if both numbers are fractions, but the idea is still the same. Anytime you're multiplying a number by a fraction, you're finding part of that number. If you're multiplying 1/4 by 1/2, you're finding 1/2 of 1/4. To find 1/2 of the fraction shaded above, we need to split it down the middle. 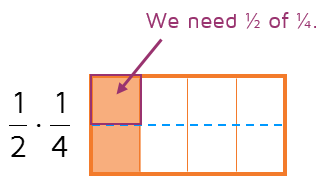 We can do this by drawing a horizontal line halfway across the box. 1/2 of 1/4 is half of the shaded part. So what is 1/2 of 1/4? By splitting the box down the middle, we now have 8 equal boxes and want only one of them. This means the answer is one out of 8 pieces: 1/8. Do you see a shortcut that we could have used? To find the answer without a diagram, we can multiply the numerators together (1 x 1 = 1) and multiply the denominators together (2 x 4 = 8) to get the answer. ​Let's look at one more example to see if this shortcut still applies. Let's say we have 2/3 times 4/5. This means we want 2/3 of the fraction 4/5. Let's start with a picture of 4/5. 4/5 means the whole has been divided into 5 equal parts and we have 4 of the 5 equal pieces. If we want to find 2/3 of 4/5, that means we need to find 2/3 of the shaded part above. 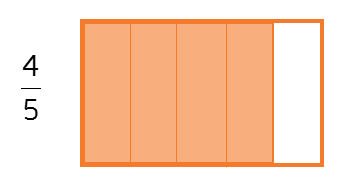 To do this, we can split the rectangle into 3 equal rows. To find 2/3, we need 2 out of the 3 rows. So what is 2/3 of 4/5? When we split the box into 3 rows, we formed a rectangle that is 5 x 3. This gives us a total of 15 equal pieces. We only wanted 2/3 of the shaded part, so we need to count only what's shaded in 2 out of the 3 rows (inside the purple box shown above). We can see that this gives us 8 equal pieces out of 15 total: 8/15. Can you see the shortcut? To find the answer, we can multiply the numerators together (2 x 4 = 8) and multiply the denominators together (3 x 5 = 15). 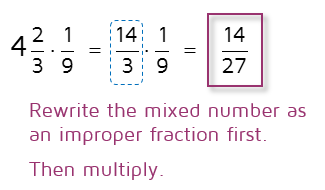 You do not need to draw a picture every time you multiply two fractions together. Instead, use the shortcut. To multiply fractions together, you just multiply straight across. Multiply the numerators together. Then multiply the denominators together. Last, simplify your answer if necessary. There is an another option that may be easier. Instead of simplifying at the end, you can simplify in the beginning. If you simplify first, it can be easier to see common factors with the smaller numbers at the beginning. It does not matter if you simplify first or last, you end up with the same answer. Choose the method that seems easiest to you. What do you do if only one number is a fraction is the other is a whole number? 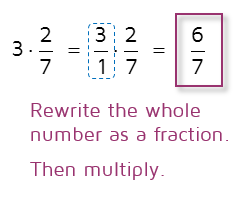 Change the whole number into a fraction by using 1 as the denominator. Dividing by 1 does not change a number, so any whole number can be rewritten with a 1 in the denominator. 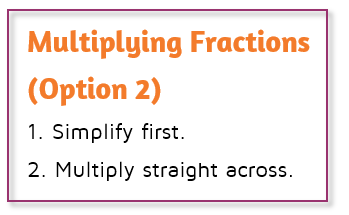 After you've written the whole number as a fraction, you can follow the steps for multiplying fractions. One or both of the numbers you're multiplying might be a mixed number. Before you multiply, first rewrite the mixed number as an improper fraction. The rest of the steps will be the same. Want to learn how to add fractions?